I last refinished the cribboards in 2004, the teak trim in 2008. 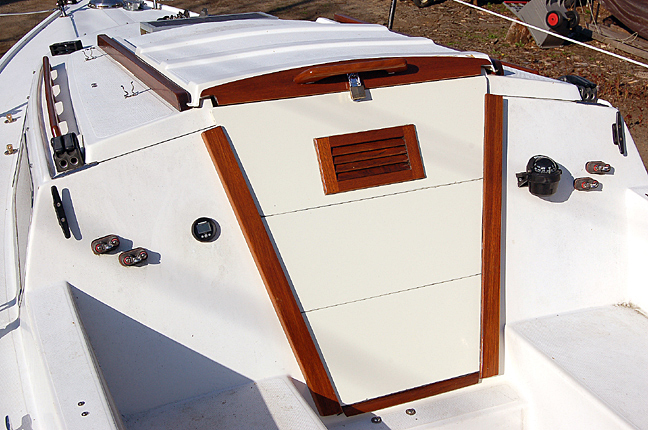 The end of last season brought a bit of cosmetic damage to the cribboards and the sliding hatch's teak eyebrow. I'd used strips of duct tape to seal the gaps between them before the remnants from Hurricane Earl arrived in September, then a subsequent nor'easter in October. When I removed the duct tape it also pulled off paint and varnish. The plan was to bring them inside for the winter and refinish them again. After trailering Chip Ahoy home for winter storage, I closed up the companionway with a piece of tarp -- and more duct tape -- then covered the boat for the winter. With the hint of spring in the air at last, the daylight temperatures rising to above freezing, it's time to start my "winter" indoor project for this year, somewhat later than usual, but it's been a very hard winter with near-record snowfall that's kept me busy moving it out of the way almost non-stop. Immediately upon uncovering Chip Ahoy I'm going to need to remove the piece of tarp taped over the companionway opening and have the cribboards and hatch eyebrow ready to install, Job One this season. This is New England after all, where we don't have spring so much as monsoon season. Yesterday I cleared off the clothes dryer and put the standby sheet of plywood over the washer and dryer, again creating my temporary workbench. This morning I laid out the damaged pieces, and began the prep work. After removing the latch hardware, I cleaned up the cribboards and eyebrow with acetone. Then I masked off the louvered vent insert in the top board, both sides, to avoid damaging the teak while sanding or later painting around it. It was reasonably warm today -- low-50s -- so I took the pieces outside and sanded them smooth using my Makita finishing sander and 80 grit paper. Starting late has its advantage: It's better to create the dust outdoors this time instead of it floating around in the laundry room waiting to settle into the wet paint finish. I had intended to remove the hatch handle from the eyebrow, but it's so solidly attached even without its two screws, cemented by bedding compound, that I decided to leave well enough alone; as a handle it needs all the strength it can have. After masking off its base, I hand-sanded the eyebrow lightly with 100 grit paper. With the sanding complete, I decided to repair some of the small damage on the cribboards -- primarily a corner piece on the lower board that broke off last season, but as long as I had the Marine-Tex out, mixed, and some leftover, I touched up a few minor dings. The lower cribboard when removed doubles as sort of my cabin desktop (photo left). When using the laptop aboard I run the wireless mouse over its surface; it fits nicely on my lap when I need something to write on, so I want it glass smooth. Once the Marine-Tex had hardened, I sanded it down and shaped the edges. I decided to complete the cribboards before moving on to the teak eyebrow and the varnishing. After a bit more overall sanding, I was satisfied that they were ready for the first coat of paint. I dug out the quart of Pettit Easypoxy (single component polyurethane topside paint), 3108 Off-White, that I used the last time I painted them; gratefully it's still good seven years later with plenty remaining, not even any skim in the can. Though I've sanded both front and back sides and all edges, I'm painting the exterior surfaces first as they need the most attention. When that's done I'll flip them and paint their backsides. I gave the first coat of paint a couple of days to thoroughly dry, then today wet-sanded the cribboards with 220 grit wet-and-dry paper; front, back and edges. Where the duct tape had pulled off the original paint it took some feathering of the edges. I applied another coat of paint to the exterior sides. The lower two cribboard exteriors look pretty well covered, but I'm not satisfied with the top one; the tape damage depressions still need to be filled further. It will get another light wet-sanding tomorrow before another coat of paint, presumably the last.